Convenient topical Solution is the next generation in the Advantage family of products. Advantage Multi is highly effective at preventing heartworm disease and treating and controlling intestinal roundworms, hookworms and whipworms all in one, easy-to-use, monthly topical solution. 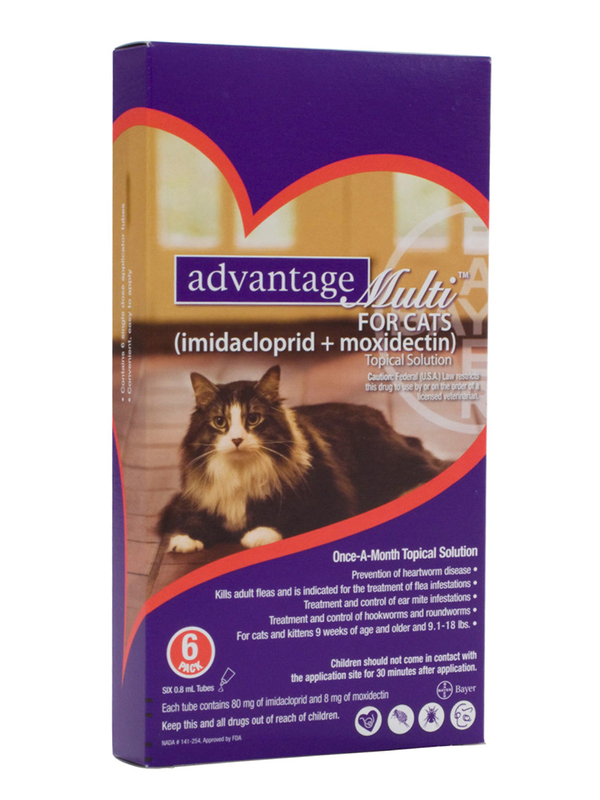 Advantage Multi for Cats also treats and controls ear mite infestations. Uses: The combination of imidacloprid and moxidectin is used in dogs and cats for the prevention of heartworm disease and the treatment and control of flea infestations, hookworms and roundworms. It is also used for the treatment and control of ear mites in cats and whipworms in dogs. Advantage Multi for Dogs (10% imidacloprid + 2.5% moxidectin) is a colorless to yellow ready-to-use solution packaged in single dose applicator tubes for topical treatment of dogs. The formulation and dosage schedule are designed to provide a minimum of 4.5 mg/lb (10 mg/kg) imidacloprid and 1.1 mg/lb (2.5 mg/kg) moxidectin based on body weight. Active ingredients: imidacloprid 10% and moxidectin 2.5%. Once-a-month dosing. Imidacloprid is a chloronicotinyl nitroguanidine insecticide. The chemical name for imidacloprid is 1-[(6-Chloro-3-pyridinyl)methyl]-N-nitro-2-imidazolidinimine. Moxidectin is a semisynthetic macrocyclic lactone endectocide derived from the actinomycete Streptomycetes cyaneogriseus noncyanogenus. The chemical name for moxidectin is [6R, 23E, 25S(E)]-5-O- Demethyl-28-deoxy-25-(1,3-dimethyl-1-butenyl)-6,28-epoxy-23-(methoxyimino) milbemycin B.